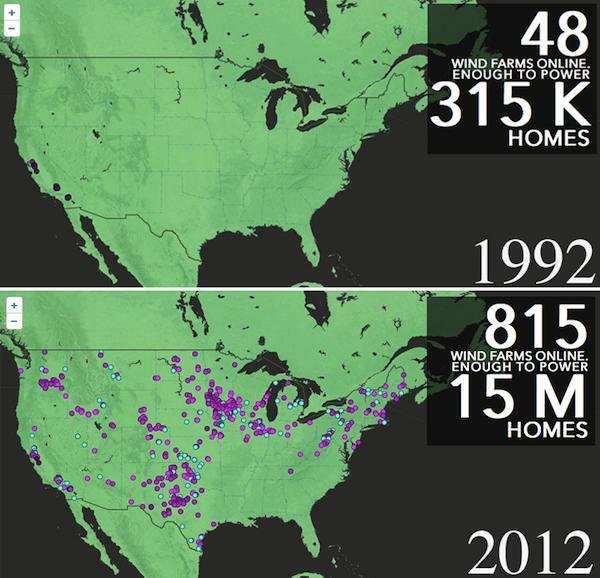 The above images are snapshots from a new US Department of Energy interactive map that shows the strong growth of wind power in the United States since the early 1990s, and especially over the past 10 years or so. The map illustrates that up to the mid-1990s, there were really only a handful of wind power projects across the country, and none outside California. During the past 20 years, the number of wind energy projects has gone from 49 to 815, spreading throughout the country into states such as Iowa and Texas, according to a new report from the U.S. DOE. The United States saw over 13 gigawatts of new wind power capacity installed in 2012 alone, which doubled the amount installed in the previous year. By 2012, the total electricity grid-connected wind capacity stood at a substantial 60 gigawatts. This is enough to supply power to about 15 million homes, but there is still plenty of room for further wind power growth. The U.S. has a population of about 314 million, and well over 100 million households.